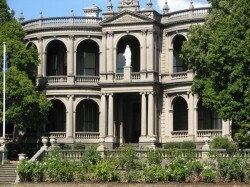 The mansion, now home to Loreto Mandeville Hall, a Roman Catholic day school for girls, was extended in the late 1870s by Charles Webb for Joseph Clarke. Clarke enlarged the original 1869 12-room two-storey brick residence into a 30 room mansion. The ornate facade and front portion with grand entrance hall and conservatory, oak parlour, Indian room and exotic bathroom date from this period. A sellout in past years so early bookings essential.